Learn how to prevent fraud in securities transactions and address pending litigation. 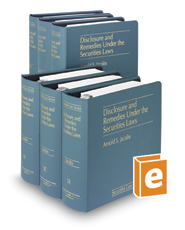 This treatise covers the six major types of fraud within Rule 10b-5. Discusses the practical application of the rule, offers litigation insights, and analyzes relevant related statutes and case law. For example, use the discussion of tests for determining whether a statement contains a misrepresentation or an omission of a material fact to advise issuers or broker-dealer clients on reducing potential 10b-5 liabilities and pitfalls.